When choosing learning objectives, I'm going to focus on things we are currently addressing in our PLC Smart Goal, or critical skills that consistently need reinforcing. 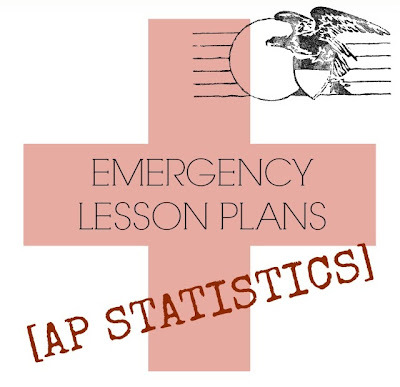 Crowdsource your emergency plans with co-teachers. To give yourself ultimate flexibility (particularly in your emergency back-up), keep a class set or at least enough for 2 kids to share of your course textbook in a closet or cabinet nearby. Make it something you'll at least consider grading when you return. I have three thematic goals for my AP Stats students throughout the year: data gathering, data crunching, and technical writing, so all of the options listed here, so if I stick to those goals (principle #1), I'll have something that can be mostly applicable for students no matter where we are in the curriculum. AP Practice Exam: The College Board releases items from old exams on their website. Might as well take advantage. 1997 Released Practice Having students complete this all in one hour would be an impossibility, so you've got at LEAST two days of material here. I would have students work in pairs on either the multiple choice or free response and collaborate quietly. Free AP Stats Practice Exam This test is secured behind your College Board Course Audit login, so be sure to have that info handy. "How Long Is a Minute" Materials and resources are usually intentionally scarce on guest teacher days, so its impractical to have plans that require elaborate handouts or materials list. This experiment is my current emergency plan, and I love it because its easily approachable early in the year before we've done a TON of stats work, and only requires a clock in the classroom with seconds. Probability Simulator TI 83/84 app + this handout The handout is actually for a more extensive project, so you'd have your students BEGIN the project on this day (and work on it periodically over a matter of days), or just have students complete a portion of the work.